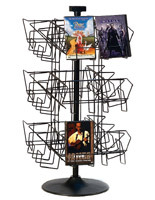 The Wire Racks can Hold CDs, DVDS, and Books for Placement by Checkout Counters. 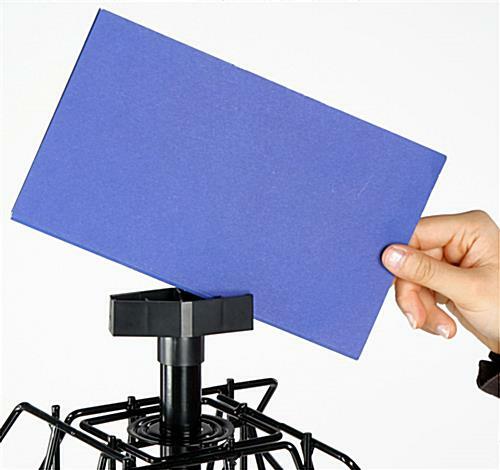 The Rotating Stand is Best Placed on Cash Wraps for Impulse Buys from Customers. The Wire Racks Have 8 Slots for Highlighting Multiple Items. 8 slots are available to display many items. Construction of durable metal will complement any setting. 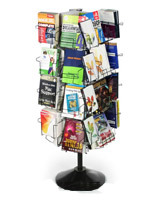 Open-shelf design allows for placement of book, DVDs, CDs and more! 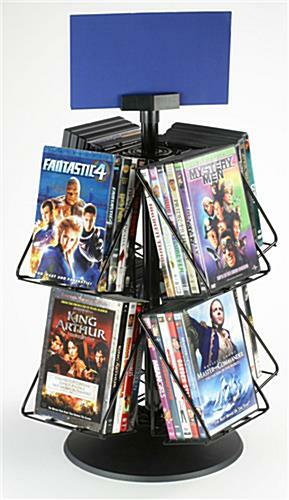 These wire racks are prefect ways to showcase your merchandise. 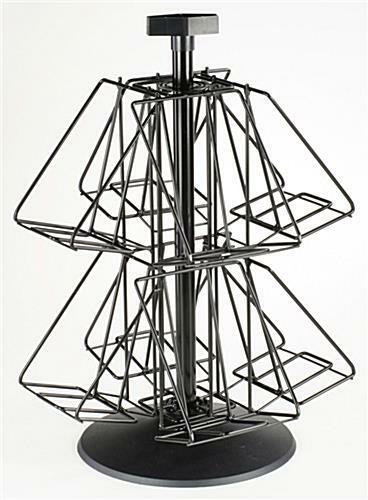 These countertop stands are made of durable wire with a finish in gloss black gloss and a base of plastic. 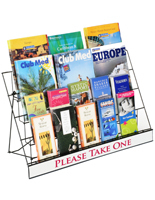 These tabletop holders, wire racks will organize promotional materials and goods and still be highly visible to customers. The countertop racks spin 360° to make for easy viewing by shopper no matter the angle. 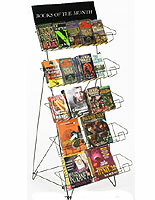 The wire racks that are great for checkout counters will tempt customers to make impulse buys. Put the newest music, movies, and reading material in these displays to see how they increase sales! 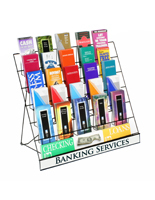 These wire racks, called countertop displays, have 8 compartments that will make for versatile advertising. 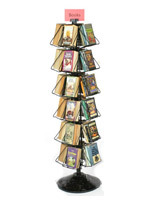 These metal holders are great for presenting a wide variety of items, like DVDs and books. 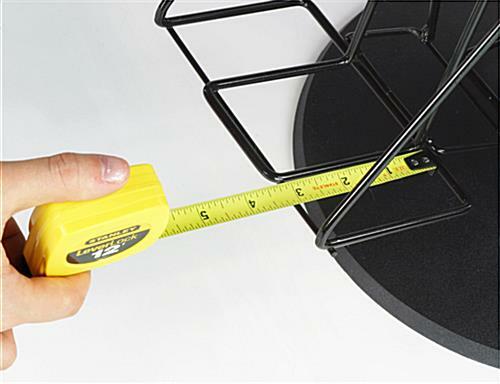 The wire racks that have pockets measuring 3-1/4" deep allow owners to highlight any number of goods. The countertop racks are provided with a sign holder clip on top of the unit for placing important information. 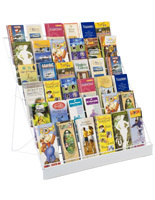 The wire racks do not have custom signage included in purchase and needs to be provided by customers. 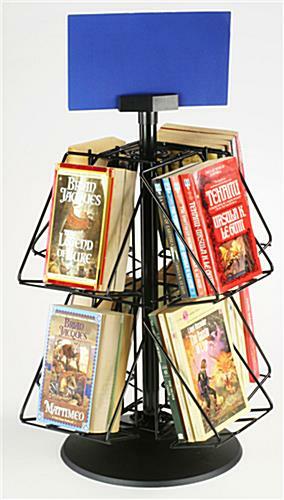 These metal stands are most commonly placed in book stores, gaming environments, grocery stores, and more locations. 14.8" x 22.0" x 11.0"
5.8" x 7.5" x 3.3"